Richard Hunt’s Tower Hybrid, 1979, captures movement and emotion as it penetrates space with its sharp angular forms emerging from a heavy COR-TEN steel cube. 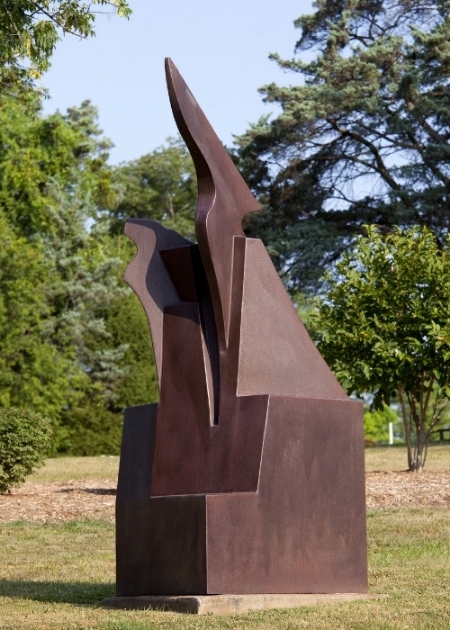 An African-American sculptor, Hunt is influenced by elements of Cubism and Surrealism, reacting to both formalism and expressionism. His impulses lie outside the strictly formal terms of object making and attempt to capture aspects of a changing, fleeting nature. Rooted in the union of opposites, fusing drawing and sculpture, Tower Hybrid’s fluid, elegant lines play against the weight and texture of the material. This particular arrangement of forms illustrates organic growth while remaining firmly fixed and visually connected to the landscape.